The cuisine of Northern France is extremely different from the rest of the country, main reason is of course the colder climate. 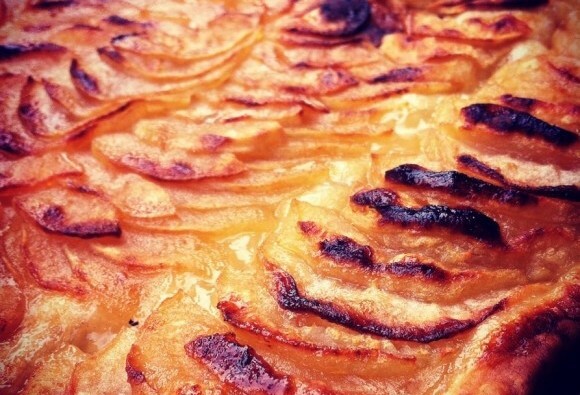 At Autumn (when the apple harvest is coming) one of the region’s most traditional dishes is the Normandy style Apple-Tart. Two unique ingredients in this tart are the Calvados and Frangipane. First we start with the dough - mix the flour and salt, add butter and mix with your fingertips until all is crumbled, add the water and continue to mix until uniform (not more than 1-2 minutes). If too dry, add more water. Wrap in a plastic wrap and put in the fridge for a minimum of an hour (can be stored up to 3 days in the fridge or 3 months in the freezer). Then we continue with the Frangipane - cream the butter and sugar until light and fluffy, mix in the eggs and Calvados. In a smaller bowl, mix the flour and ground almonds, add this mix to the rest and stir until all is uniform. Take out the dough, roll it so it covers the tart pan with an extra overhanging, roll it into the tart pan and press it inside, make holes in the bottom using fork and return to the fridge to cool for another 20 minutes. Turn on the oven to 180c. 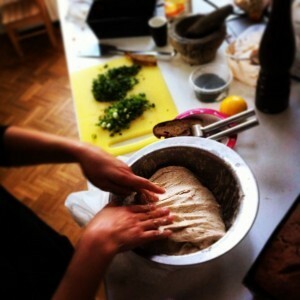 Take out the tart pan from the fridge and smear the Frangipane on the dough. Skin, core and thinly slice the apples, spread them in any way you like on top of the Frangipane (my favorite is to create diagonal rows from one side to the other, but you can also do a spiral) and sprinkle the sugar on top. Place in the middle of the oven and bake for 25-35 minutes or until it is golden-brown, take out to cool down. During the bake, it is traditional to warm up a jam (usually apricots or some other light-colored jam) until it is a bit liquid (in case the jam is a bit solid, add some water), mix in the Calvados and when the tart is out - finish the top with the mixture. I personally do not find the need for the this, but you are welcome to try. Wishing everyone a cozy Autumn with lots of tastes and stories around the table.